It is my great pleasure to join you at this reception in honour of participants of the Sixth China Executive Leadership Programme (CELP). Let me extend my warm welcome to all the participants, and thank you, Lord Powell, for hosting this event. I would also like to congratulate Professor Peter Nolan from Cambridge University and his colleagues. I believe that the success of CELP is very much due to the initiative and energy of people like him, both in the UK and in China. CELP was established in 2005. It is an education and development programme for high-ranking Chinese top executives. It is a measure of the success and value of CELP that close to 150 senior executives of leading state-owned companies in China have participated in its seminars and lectures. They shared experiences and knowledge about strategic and global management.I believe the CELP has fulfilled its mission of training high caliber business leaders for China. The 6th CELP builds on the success of the past five years. It comes at a timely moment. First, 2011 is the first year of China's 12th Five-Year Plan. Through this China is working hard to upgrade its way of development. This is being done through economic restructuring, boosting domestic demand and consumption and encouraging innovation. Second, Britain is also reorienting its growth strategy. It is formulating mid to long term plans in many industries. Change and improvement are coming to the financial industry, low-carbon economy and new energy sectors. Third, Premier Wen Jiabao visited this country just last week. The visit made great contribution to increasing mutual understanding and cooperation. The visit also created new prospect for enhancing political and strategic dialogue and for a growing trade, investment and financial partnership between China and the UK. In this context, Chinese businesses are faced with rare opportunities. I hope all the Chinese participants take full advantage of this high quality programme in at least the following three ways. First, learning. It is crucial to learn from the success of established UK businesses. This will be a source of inspiration and innovation for change and reform in Chinese companies. They will be better equipped as a result for implementing the 12th Five Year Plan. Second, communication. The CELP offers a platform for Chinese businesses to share their success stories in the process of reform and development with British colleagues. Third, cooperation. The CELP helps Chinese business leaders to get first-hand knowledge of the market needs, strengths and investment climate of the UK. They will go back to China with new ideas about how and where China and Britain can cooperate. I hope and I am confident that with close cooperation between the organizers and joint efforts of all participants, the 6th CELP will be a great success. I wish all CELP participants a healthy and pleasant stay in the UK. 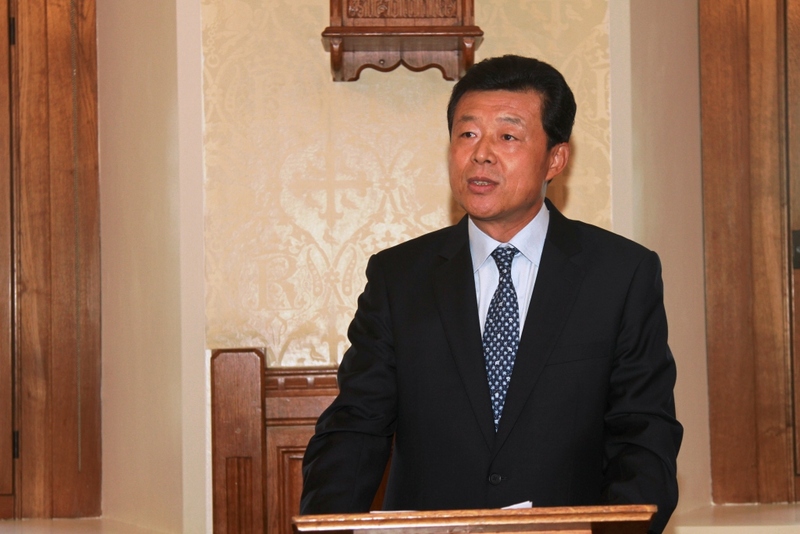 On 6th July, Lord Powell, a former foreign policy advisor to British Prime Minister, hosted a reception in honour of participants in the 6th Chinese Executive Leadership Programme (CELP) at the House of Lords. 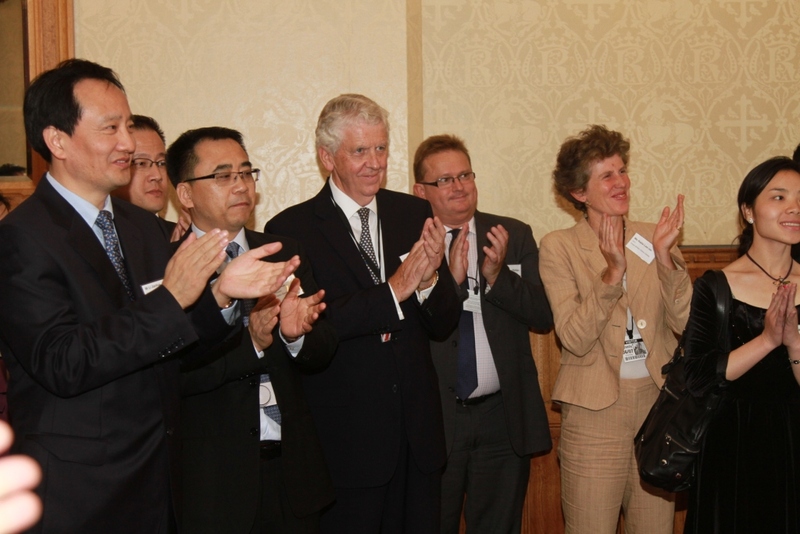 About 70 guests were present, including Minister of State at the FCO Lord Howell, Mark Hendrick, Chairman of the All Party Parliamentary China Group, CBBC Chief Executive Stephen Phillips, Katie Lee, CEO of the Great Britain China Centre, Douglas Flint, HSBC Chairman and Sir John Boyd, Chairman of Asia House. Ambassador was invited to attend and made the above remarks. In his remarks, Lord Powell commended Premier Wen's recent successful visit to the <?xml:namespace prefix = st1 ns = "urn:schemas-microsoft-com:office:smarttags" />UK, and believed that the visit enhanced practical cooperation between the two countries in trade and investment, increased dialogue and mutual understanding and would surely take China-UK relations to a higher level. Mr Li Jianhua, Party Secretary and Vice President of Chinese Academy of Governance addressed the reception on behalf of all the participants and expressed the hope to increase mutual understanding between china and the UK and promote win-win cooperation through extensive discussions with British scholars, business leaders and officials. Co-hosted by the CPC Organization Department, the State Council Development Research Centre, Peking University and the University of Cambridge and supported by the China Development Research Foundation and the China Industry Development Research Centre of Peking University, CELP has held 5 successful programs since 2005 and nearly 150 senior executives of Chinese state-owned enterprises have participated. The sixth CELP this year consists of over 30 businesses leaders from famous Chinese state-owned enterprises, 11 of which are on the Forbes top 500 list.